April Fredrick - Jane Eyre; David Stout – Edward Rochester; Clair McCaldin - Mrs Fairfax/Hannah; Gwion Thomas – Mr Brocklehurst; Mark Milhofer – Rev. St John Rivers/Richard Mason; Lesley-Jane Rogers - Sarah/Diana Rivers; Lorraine Payne – Leah/Mary Rivers; Joseph Bolger – Rector’s Clerk; Alan Fairs – Rev. Wood/John; Samuel Oram – A Servant; Andrew Randall – Verger; Andrew Mayor – Briggs. At last one of John Joubert’s operas – his seventh and most recent - has made it onto CD. To celebrate his 90th birthday on 20 March 2017 (see article Joubert at 90) SOMM has issued this recording of a live concert performance given in Birmingham in October 2016. I was unable to attend that performance but I read the review by my Seen and Heard colleague, Geoff Read and some further reflections by Rob Barnett, who was also present that evening. Their comments whetted my appetite for these discs. Jane Eyre has been heard once before, in a Birmingham performance in 2005, but my understanding is that this doubtless well-intentioned effort was given with reduced forces not sanctioned by the composer. So this present performance was the true premiere of the opera. If I may I’d like to start, as it were, at the end. The last track on disc two is a conversation between John Joubert and Christopher Morley. Mr Morley was a pupil of Joubert and as Chief Music Critic of the Birmingham Post newspaper he has written about Joubert’s music a good deal; so he’s a very appropriate choice as interviewer. He summarises a few key points from their conversation as part of one of the essays in the booklet but I’d recommend that anyone coming new to the set listen to the conversation first. I did so before listening to the opera for the first time and I found it a valuable introduction. From this conversation we learn that Joubert caught the opera ‘bug’ – first Wagner, later the Italian repertoire – after he came to the UK in 1946. He expresses also a great admiration for the operas of Britten. The story of Jane Eyre first attracted him as the ideal subject for an opera because it’s a great love story, he says. The opera was not written to commission and so once he made a start on it in the 1980s work proceeded during the times when he was not occupied with fulfilling commissions. The composer’s own website gives the dates 1987-97 as the period of composition. Joubert and his highly skilled librettist, Kenneth Birkin, another former pupil, distilled Charlotte Brontë’s novel into what seems to me to be a tautly constructed narrative, focusing on the essentials. An element of contraction was inevitable because the book is so long and also because the decision was taken to focus on Jane’s adult life. So first we encounter her about to leave her post as a schoolteacher at Lowood despite the pressure put on her to change her mind by Mr Brocklehurst, one of the governors (Act 1, scene 1). Scene 2 finds her at Mr Rochester’s home, Thornfield, where she rescues him from the fire set in his bedroom deliberately by Rochester’s deranged wife, Bertha, whose existence is unknown to Jane. In the third and final scene of Act I she and Rochester finally declare their love to each other. Act II opens in the village church on Jane and Rochester’s wedding day. The existence of his first wife is revealed and he is “unmasked” as a would-be bigamist. Jane quietly flees the scene. In scene 2 we find her, about a year later, in the home of Rev St John Rivers. He and his sisters had taken Jane in and now he seeks to persuade her to accompany him, as his wife, on missionary work to India. In the nick of time Jane hears Rochester’s voice in her head and knows where her destiny lies. The closing scene witnesses their reunion outside the ruins of Thornfield. The house has been destroyed in another of Bertha’s arson attacks. This time she has perished in the blaze leaving Rochester free. He has reservations as to whether Jane should take him on now that injuries sustained in the fire have left him blind and crippled but she overcomes his objections and they are reunited. In the interview Christopher Morley points out that the work ends on an open chord which suggests this may not be the end of the story; does this reflect Rochester’s misgivings that he will be a burden on Jane? Joubert does not dissent. I was interested to learn from the aforementioned conversation that Joubert made some big cuts to the score so that what we hear in this performance has about 40 or 45 minutes less music than the original completed score. He felt that the opera as it originally stood was too long and that some minor situations impeded the essential flow of the drama. His scrutiny fell particularly on five orchestral interludes between scenes which, he felt, rather got in the way; that’s my choice of words, I hasten to say. These were excised. Since I have no knowledge of the original score I can only say that on the evidence of what I hear in this performance John Joubert’s judgement seems to have been spot-on; the definitive score seems to me to be a tautly constructed piece with excellent dramatic impetus. I was delighted to find, however, that the rumours I’d heard are true: the music hasn’t been discarded but instead, Joubert confirms, the interludes have been used as the basis for his recently completed Third Symphony. I look forward very much to hearing that. Although material from Jane Eyre has been recycled into the new symphony it will appear there in an expanded orchestration. In the new piece Joubert has expanded the scoring, writing for a large symphony orchestra including triple woodwind. For the opera, however, the forces are more modest. In addition to strings (here 8/4/4/4/2) single woodwind (each doubling a second instrument) and brass are specified plus piano, organ (only in the church wedding scene, I believe), timpani and a percussion battery requiring two players. If the orchestra appears rather modest and you anticipate an undernourished sound, fear not; that is most certainly not the case. The scoring is consistently colourful, imaginative and atmospheric and the ESO plays extremely well. The orchestra functions as a significant protagonist throughout the work and I found the orchestral contribution held my attention throughout and added significantly to my enjoyment. The cast list consists of 17 separate characters although there’s some doubling. Many of the parts are fairly small and two characters, though important at the time, are only involved once: Mr Brocklehurst (Act I, scene 1) and Rev Rivers (Act II, scene 2). Suffice to say that there isn’t a weak link in the cast: all the supporting singers do well. We meet Mr Brocklehurst (Gwion Thomas) early on. He arrives at Lowood school to dissuade Jane from leaving to take up her new post in Mr Rochester’s household. At the start Thomas portrays his character very convincingly as a formal Victorian gentlemen but as he seeks to persuade Jane he quickly becomes more agitated – as does the orchestral accompaniment. Gwion Thomas engages in a strong dramatic dialogue with April Fredrick (Jane) and there’s fine tension between the characters. In part that tension comes from the music but it’s also a question of what the two singers do with the music. This argument between Jane and Mr Brocklehurst is an early example of Joubert – and the conductor, Kenneth Woods – making the orchestra seem bigger than you might expect. I liked Gwion Thomas a lot and I’m only sorry that the plot means that we don’t hear from him again. Much later in the opera we encounter Rev. St John Rivers (Mark Milhofer). Initially he comes across as a rather earnest parson and you imagine that life with him wouldn’t involve a lot of laughs. Gradually, however, this earnestness expands into zeal as he tries to convince Jane not only of the importance of the missionary work that he proposes to undertake in India but also, and more significantly, that she should accompany him as his wife. The libretto and Rivers’ music are such that surely everyone in the audience must have been willing Jane “say no!” Rivers is very pressing and I think that Milhofer’s clear, ringing tenor makes him ideal casting. His exhortations to Jane and her turmoil as she seeks a way out make this a very strong scene between the two of them. Finally she’s saved by hearing Rochester’s voice in her head – or, as here, in the distance – and she realises where her destiny and duty lie. That stiffens her resolve to decline the pressing parson. The last time I heard David Stout he was singing the baritone role in Carmina Burana at the 2016 Three Choirs Festival. Though I’m not a great fan of Orff’s piece Stout’s singing and the way in which he entered into the spirit of the piece was one of several reasons why I enjoyed the performance a lot more than I expected to (review). Here, as Edward Rochester he has a much more serious and taxing assignment. I’m seriously impressed with his performance. In Act I, scene 2, after Jane has saved him from being burned as he slept the aria ‘Now the shadows close about me’ is a key moment in the opera thus far. Both Joubert’s music and Stout’s delivery depict very clearly Rochester’s inner turmoil. Stout’s singing is very fine; he displays a wide range both in the sense of emotions and his musical dynamics. This is very powerful music and the alliance of composer and singer depicts the character very well. The Act continues with a strong scene between Rochester and Jane in which their feelings for each other start to come to the surface. If any listeners fear that the fact they are listening to a concert performance rather than a staging might lower the intensity this exchange between the two principals should set their minds at rest. Each time I’ve listened to this dialogue it sounds to have all the tension and electricity of a staged performance. The duet between the two characters is in the finest traditions of operatic love duets and Stout delivers the goods. In Act II Stout is a major presence in the wedding scene, displaying powerful emotions as it emerges that his first wife is not only still alive but confined – for her own protection – in Thornfield. David Stout reserves his finest, most searching singing for Act II, scene 3. First he delivers a compelling narrative recounting the details of the fire that destroyed his home and killed his wife. Then he portrays most convincingly the conflict that he feels, wanting Jane but fearing to see her take on the burden of marriage to a blind, crippled man. Finally, when Jane has persuaded him that their lives must be together he is terrific in the ardent and then tender duetting between the two of them as the opera comes to an end. I’ve heard David Stout on a number of previous occasions but to the best of my recollection April Fredrick is a singer new to me. She’s terrific. For one thing her stamina is greatly to be admired. Not only is the title role vocally demanding but it must also be physically strenuous. Jane is onstage nearly all the time; she is heavily involved in all six scenes of the opera. The role requires Miss Fredrick to display a wide range of emotions and I never found her wanting; she is thoroughly convincing and really gets inside her character. This is vividly communicative singing. In her early confrontation with Brocklehurst she displays great mental strength, fighting her corner and culminating in a display of passion at the words ‘Cast off your chains.’ Much later Miss Fredrick also excels during the exchange with Rev. Rivers, depicting Jane’s inner turmoil very successfully. Inevitably, though, it’s Jane’s scenes with Rochester that define April Fredrick’s performance. She makes her soliloquy at the start of Act I, scene 3 (‘This is the sweetest hour’) very touching, singing the music eloquently. When Rochester arrives she matches David Stout in terms of vocal accomplishment and sheer commitment and her solo at ‘My love, lay your head upon my breast’ is heartfelt and warmly sung. This was one of several occasions when I was put in mind of the romantic warmth and lyricism that one experiences in parts of Samuel Barber’s Vanessa. When the wedding day falls apart and Jane leaves unobtrusively her farewell to Rochester, unheard and unnoticed by him, is sung with just the right degree of pathos. In the opera’s final scene Jane takes control, quells Rochester’s doubts and grasps her destiny. Here Miss Fredrick’s performance reaches its zenith. Her gentle singing when she sees Rochester for the first time since their aborted wedding day is most affecting and then she puts across the ecstasy in Joubert’s music when they are reunited. The closing moments of the opera are given over to a dialogue between the two lovers that is by turns ardent, lyrical and tender and I’m completely won over by Fredrick’s characterisation and by the quality of her singing. The conclusion, ‘It is as if, transcendent’ which the two sing together, often in unison octaves, is tender and moving. I’d go so far as to say that the title role could have been written with Fredrick’s voice in mind: this is a character assumption of great accomplishment. So, all the characters are convincing but they convince not just because each singer performs with skill and intelligence but also because they leverage their portrayals off marvellously expressive music. This is a fine romantic opera. The music connects very directly with the listener. I can best illustrate this by saying that on the day I received these discs I played the opera twice, once for an initial detailed listening as part of the reviewing process and later for sheer pleasure. I can do no better than to quote from the extensive note by Kenneth Woods about the music of Jane Eyre. He writes that the opera “is the work of a melodist of the highest order who writes for the voice with profound understanding.” He also comments that in the opera’s “orchestral landscape all the parts are full of purpose and meaning; a tapestry of counterpoint which serves to complement and enrich the sung drama.” There speaks someone who has immersed himself in the score for this recording but the virtues which he describes in the opera are, I believe, equally and readily apparent to the listener. As the author of comments such as those I’ve just quoted you won’t be surprised to learn that Woods’ belief in the score is completely evident from his conducting of it. The score is taut and dramatic and so is his direction of it. I should say a few words about the production values. SOMM have really gone to town with this release. The forty-page booklet includes a very clear synopsis and the full libretto. There are also short essays by Christopher Morley, by John Joubert himself and a touching personal note by the composer’s daughter, Anna. The most substantial contribution is a detailed and highly perceptive essay about the music by Kenneth Woods. I’ve never been to the Ruddock Arts Centre in Birmingham so I don’t know what the acoustics are like. Producer Siva Oke and engineer Ben Connellan have recorded the performance expertly. The singers are well balanced relative to the orchestra and their voices register extremely well – the words are very clear. As for the orchestra, it makes its presence strongly felt but never overwhelms the singers. The presence of an audience is not apparent – no pesky coughs – though there is applause at the end of each act. Listeners who dislike applause on live recordings – I’m not one of them – will be glad to know that there’s a respectful silence after the music stops before appreciation is shown. Siva Oke tells us in a short booklet note that some patching was done from the orchestral rehearsals but this is completely unobtrusive. As Eric Morecambe might have said, I couldn’t hear the joins. Jane Eyre is a rich, inventive and very satisfying score and its cause has been outstandingly well served here. As I’ve said already, prospective purchasers should not fear any lack of intensity or dramatic involvement because this is a concert rather than a staged performance. 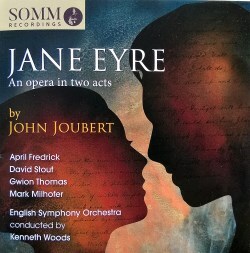 As to the possibility of a staged performance I suspect it’s fanciful to expect Covent Garden or ENO will lead the way but I hope this superb recording will encourage other opera companies seriously to evaluate Jane Eyre. Opera North or Glyndebourne would make an excellent job of it, I’m sure, and it would be well suited to some of the summer opera festivals that take place in the UK. It would be a more deserving case for staging than yet another obscure baroque opera. This set is a triumph for Kenneth Woods and his excellent cast and orchestra. It’s also a triumph for SOMM who yet again – but on a much more ambitious scale this time – have demonstrated commitment to Joubert’s music. Above all, though, this release is a triumph for John Joubert and the best possible salute to him on the occasion of his 90th birthday. It’s hard to imagine what it must be like to put a decade of your creative life into the composition of an opera and not to hear it. Perhaps he despaired of ever doing so. I hope that he will feel vindicated and be overjoyed at hearing Jane Eyre brought to life so vividly in this splendid performance.